Mifflin Place, built by George Mifflin in 1748 on 100 block of Pemberton Street. Depicts back of two detached homes and their grass yards. In front of the house on the right, a woman is standing near clothesline with laundry hanging; man leaning out of the window and a girl in the doorway of house on left. 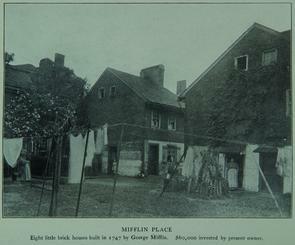 Caption on photo reads:" Eight little brick houses built in 1747 by George Mifflin. $60,000 invested by present owner."